Not being what he calls "a lesser life-form that insists it is a higher life-form", the Roach has escaped the ravages of Social Media and the epidemic of Global Dumbing, enabling him to write about it, and spread his message by blatantly advertising about it over Social Media. If the Roach was known to be anti-human, I would say this might actually all be a sinister, self-perpetuating plan on his part, but he assures me he only despises humans who are not his fans, about whom he said, "...that bunch of wonderful people who wait patiently for the Roach's every post - God bless them all." 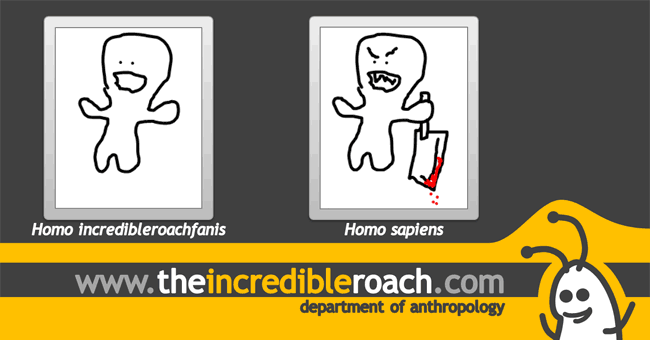 The above illustration has been taken from "A Roach's Eye View of Human Evolution"
The Roach told me that this second "Avatar" is still going to be shades of gray and golden yellow, not blue, which really confused me, and that it would be a whole lot smarter. Me: "C'mon, your fans don't need some behind the scenes improvements. They want MOAR CONTENT!" Roach: "Can you imagine the poor things having to remember URLs like http://www.theincredibleroach.com/Content/newsfeed/Stories.php?ArticleNumber=18, once they've lost that which keeps them alive today?" Roach: "Don't be foolish. Only things with blue logos are important to humanity - because they're like water, which most humans think is blue, but is in fact colorless. Anyway my new Avatar will solve this problem." Me: "Oh! Avatars are blue too, so that will automatically solve everything! Genius!" Me: "No? Vishnu is blue too, and He has avatars... who weren't all blue. Damn it! What is it then?" Roach: "Imagine a post-apocalyptic world, where there is no Facebook, Twitter, the UN, Durex, or other stuff with blue logos, and you have to tell your other cave-mates about this blog entry over the din of your shotguns exploding zombie heads as they bay for brains and your wives screaming about the mess you're creating and how they're tired of cleaning up after you? Wouldn't http://www.theincredibleroach.com/blog/Avatar2 be a lot easier to shout out?" Roach: "Well, that takes some unglamorous behind the scenes work, and that's what I'm up to - shifting from the primitive use of PHP to building a proper MVC based platform. It should also, ultimately, help me roll out new content faster." Me: "Why not just use something like Wordpress, or CodeIgniter then?" Roach: "Because that was made by humans." I don't remember the rest, other than being told to stay tuned, and being shown an instructional video of things I should not do, that strangely made me want to do exactly everything depicted. Oh, and the Roach also told me to tell people to not Like his page straight after that.